A round shaped hill resort in Madhya Pradesh, Pachmarhi is also known as the “Queen of Satpura.” Set at the distance of 1,067 feet, Pachmarhi offers a mixture of attractions ranging from ancient caves to beautiful monuments. 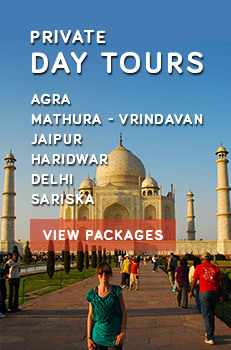 The heart-capturing waterfalls, scenic sites, large mountain range and lush green hills stretch over 60 sq. km in Pachmarhi through dramatic natural splendour. Truly it is the most visited hill station of India. Pachmarhi is greatly meant to the highly innovative officer of the British reign, Captain Forsyth for its all round development. This has been converted to a famous Sanatorium and later to a hill station under the recommendation of this great officer. Pachmarhi is a large flat terrain encircled by the bigheaded hills of the Satpura range. Its rural area is characterised by rocky hills, woody forests and deep canyons. 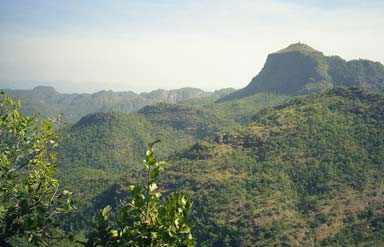 Pachmarhi as the land of magnificent natural beauty was discovered in 1857 by Captain James Forsyth of the Bengal Lance. Shortly this went a hill station and sanatorium for British forces in the Central Provinces of India. Pachmarhi takes its name to the Pandava Caves, wherein 'Panch' means five and 'marhi' means caves. Jata Shankar in Pachmarhi is a holy place of Shaivite tradition. This natural cave houses a natural Shivalingam under the shadow of big rock. The stone formation in the cave fits the hundred headed divine snake Seshnag. 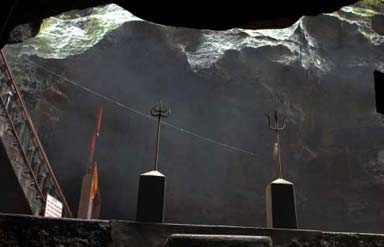 Jata Shankar cave is the place where Lord Shiva supposed to have concealed himself from Bhasmasur. 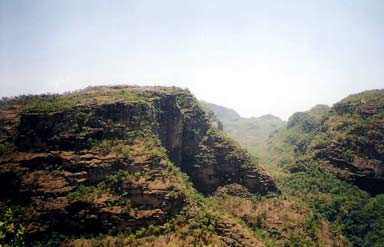 Handi Khoh in Pachmarhi is an impressive canyon with a 300 feet high crag amidst a dense forest, endowed with marvellous scenery. Bounded by a deep woody forest, this lovely place is intimately related to Lord Shiva. The popular belief is that Handi Khoh was a lake earlier. An evil snake (actually a demon) was guarding the lake. Lord Shiva killed the snake and the fury of the divine battle dried up the water in the lake and the empty space assumed the shape of a handi (pot). Located on a small hill, Pandava Caves in Pachmarhi are said to have been a shelter point of the Pandavas during their period of exile. 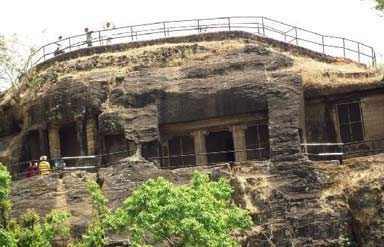 Pandava caves have been carved out of a low hummock. These five caves also became a refuge to Buddhist monks in 1st century. Among the five caves, 'Draupadi Kuti' is the cleanest and the most airy. Mahadeo hill in Southern Madhya Pradesh is famous for the ancient shrine of Lord Shiva, situated in the northern part of the Satpura Range at an altitude of 1363 m. This holy shrine holds an imposing idol of Lord Shiva and a fabulous Shivalingam. The tranquil premises of this holy shrine gets crowded with the millions of devotees on Mahashivaratri day. This is the point from where Captain Forsyth discovered Pachamarhi in the year 1857. After that the British developed Pachmarhi as a resort. This vantage point avails the broad view of Pachmarhi and its magnificent environs. The most spectacular vision from Forsyth Point is Handi Khoh ravine. Climate during summers from May to June remain highly bracing and pleasant in Pachmarhi. The time period to visit this place is all through year, but the best period is from October to June. By Air: Bhopal airport is the nearest airport to Pachmarhi, at a distance about 195 km away from Pachmarhi. The major airlines link Bhopal to various cities in India, including Gwalior, Mumbai and Delhi. By Rail: Pipariya is the nearest railway station to Pachmarhi. Falling at a distance of about 47 km away from Pachmarhi, Pipariya is on the main line to Mumbai – Howrah and most of the major trains stop at this junction. By Road: Regular bus services in Pachmarhi are available to Chhindwara, Pipariya and Bhopal. Buses and many private buses from Madhya Pradesh Tourism Development Corporation ply on this route. Pachmarhi is the crown of scenic beauty in Satpura Ranges!